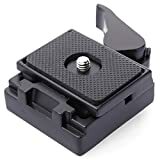 This camera quick release plate set will quickly screw onto your tripod to properly and securely position your camera for the best shooting angle. Suitable for tripod with detachable 3/8″ mounting screw. This entry was posted in Discount Photography and tagged 200PL14, Adapter, Ball, Black, Camera, Clamp, DC465, DSLR, Head, Manfrotto, Metal, Plate, Quick, Release, Tripod, XCSOURCE® by Ball Photo. Bookmark the permalink.